Can a Felon Become a Freight Broker? There are resources available for felons who are eager to show they make good employees. Some felons may have an interest in the trucking industry and becoming a freight broker. 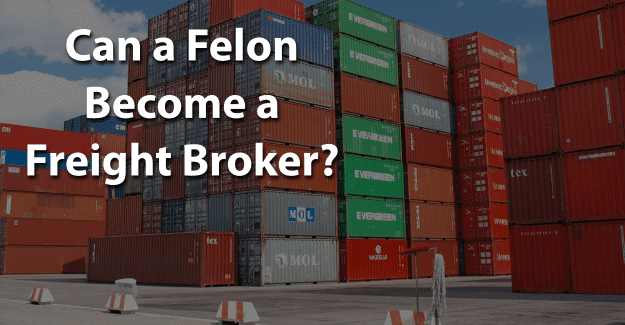 This blog post will address the issue of whether or not a felon can become a freight broker. What is Required to Become a Freight Broker? How Much Does a Freight Broker Earn? A freight broker is a contractor who makes shipping arrangements to move a client’s freight using a truck. A broker arranges a motor carrier for a client’s transportation needs from a loading dock to its destination. A freight broker also negotiates shipping rates and delivery of cargo from transportation companies with businesses. He or she keeps track of the freight, recording pickups and deliveries along with a bill of lading. This requires knowledge of shipping regulations and procedures. To become a freight broker, broker agent training is required, usually involving attending freight broker classes. A candidate must complete form 0P-1 from the Motor Property Carrier and Broker Authority. A freight broker is required to have a surety bond of at least $100,000. Additionally, public liability and freight insurance are also required. He or she operates a brokerage registered as a business in that particular state. This involves having a business license as well as a business plan. A broker must be able to find the carriers needed to transport the requested cargo. There’s no federal or state law preventing a felon from owning a business. A felon may or may not be able to obtain a surety bond, which is a type of insurance policy to protect customers. A surety bond is typically required for a plumber, contractor, mortgage provider, and auto dealer. The reason for having a freight broker bond is to guarantee that the broker will follow all rules and regulations. Having a surety bond will require valuation of an applicant’s personal and business finances as well as his or her credit score and overall financial stability. A freight broker license from the Federal Motor Carrier Safety Administration (FMCSA) is required. Companies that operate commercial vehicles transporting passengers or hauling cargo in interstate commerce must be registered with the FMCSA and must have a United States Department of Transportation (USDOT) Number. The USDOT Number is a unique identification when collecting and monitoring a company’s safety information acquired during audits, compliance reviews, crash investigations, and inspections. The U.S. Bureau of Labor Statistics reports that there were 89,920 freight brokers in 2016 with a median annual salary of $44,980 in 2017. Experience will make a difference in how much a freight broker earns annually. The area of the country in which a freight broker works also makes a difference in earnings. Those in Texas, Louisiana, and California typically earn more than a freight broker that works elsewhere. This occupation is expected to show a 2% growth by 2024 with below average increase. Demand for freight brokers depends on the economy and the demand for trucking of goods. State guidelines through the Department of Licensing and Regulation in each state decide if a criminal conviction makes an applicant unsuitable for a license. General factors are considered in all cases along with the reasons why particular crimes relate to each type of license. It’s essential to be honest when filling out an application for licensing as a freight broker. If a felony isn’t disclosed but is found on a background check, this is fraud which is a punishable crime. It could even result in being sent back to prison. Having their felony expunged can give them the chance needed to begin with a clean record and succeed in becoming a freight broker. Expunging a criminal record allows anyone to honestly state on an application that he or she has not been convicted of a crime. It’s a big challenge, but it might be worth it for a felon wanting to become a freight broker. He or she can give him or herself the best chance for success by having his or her record expunged and also documenting any programs, education, or training completed. What do you think about this blog post? Have you or someone you know been in the situation of trying to become a freight broker with a felony? What was that like for him or her, and how did he or she achieve success? Please tell us in the comments below.